These unbreakable 12 quart galvanized buckets are constructed with multiple body swedges, a reinforced rim, an offset bottom, and a durable handle. These key features make these buckets incredibly tough and long-lasting. Since they are made of rust resistant electrogalvanized steel and feature a polished exterior, they are the perfect tool for attractively storing cleaning supplies for your home. You can also use a bunch of these buckets in your garage or home to keep spare parts, toys, and miscellaneous clutter in place. This bucket is available in 8 quart, 10 quart, and 14 quart sizes. 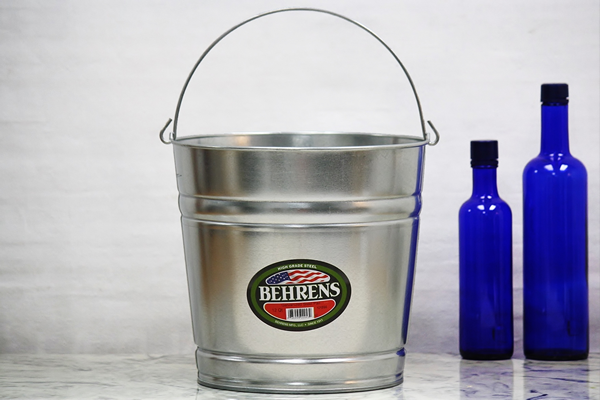 See the more-durable 12 quart hot dipped galvanized steel bucket style here. Note: This bucket is electroplate galvanized with a shiny finish. I got this to help organize my cleaning stuffs in the closet. It works really well, but as I've accumulated stuff over time I wish I went one size bigger. That being said it still works pretty well!